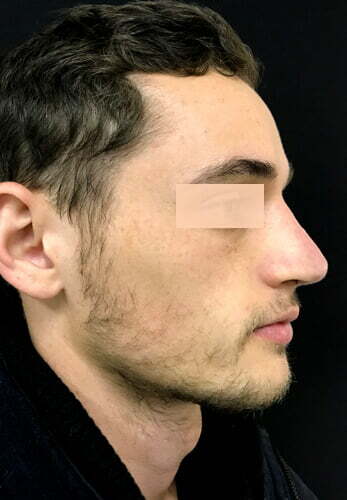 Rhinoplasty is a popular plastic surgery procedure; it can address a multitude of aesthetic and functional problems, however before undergoing this procedure it’s important to have an assessment with a qualified plastic surgeon to ascertain if you are an ideal candidate for this type of surgery. Rhinoplasty balances the form of the nose, looking at is proportion to the rest of your face, as well as its shape, size, angle and overall aesthetic appearance. In terms of function, it can reconstruct noses that have previously undergone trauma or been broken, as well as addressing noisy or obstructed breathing and snoring. As a result, rhinoplasty has become a very sought-after procedure. Whether you are considering rhinoplasty to remove a bump on the bridge of your nose, reduce its prominence, refine its tip or correct your nose after a break or accident, Dr Sharp’s ultimate priority is to make sure that your breathing and overall nasal function is preserved or improved. Good airway function is of utmost importance. Dr Sharp is well versed in a range of different rhinoplasty techniques ranging from open to closed rhinoplasty. The approach may also differ depending on your ethnicity, and gender in order to retain the unique, natural character of your face - and create harmonised appearance. Your first consultation with Dr Sharp is a double consultation; it allows plenty of time for you to discuss your concerns and goals with Dr Sharp; he will examine your nose, take photos and advise of the best approach to achieve your desired outcome. Dr Sharp will discuss the informed consent documentation, and you will receive an information pack with illustrated information sheets, your estimate of fees and your informed consent documentation inside, to take home and consider before proceeding any further. If you wish to go ahead with surgery, most patients have at least one further consultation with Dr Sharp to discuss the procedure again and go through the informed consent documents once more. In a closed rhinoplasty, all incisions are made inside the nose. As a result, no scars are visible on the exterior of the nose so the operation is practically invisible to the naked eye. 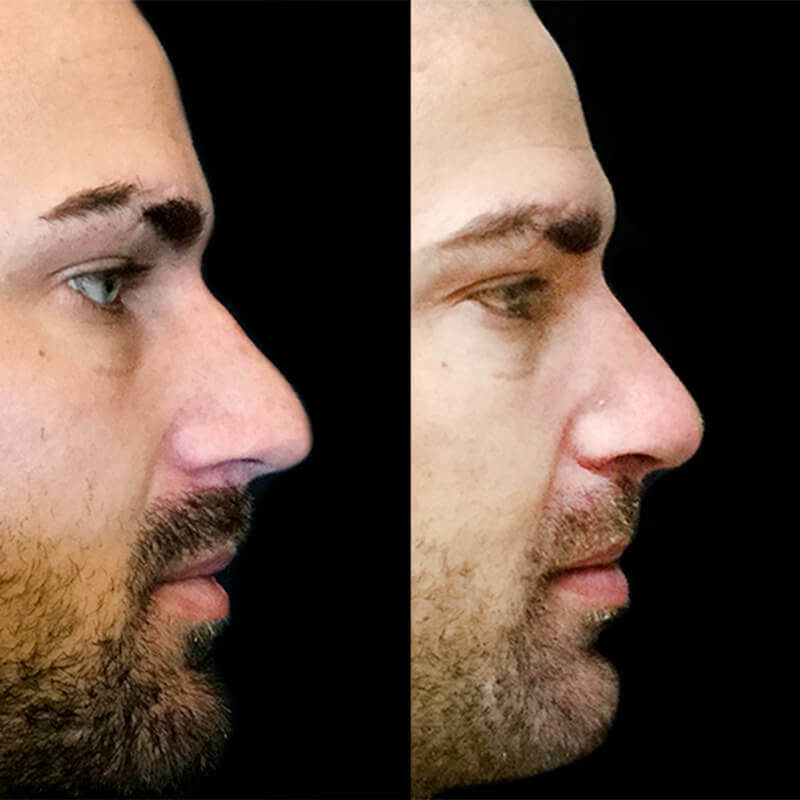 This technique is only appropriate for selected patients, who don’t require significant adjustments to their nasal bridge, and who don’t require their nose tip to be significantly corrected. An open rhinoplasty also limits most of the incisions to the interior of the nose. However, one small incision is made across the skin, between the two nostrils. 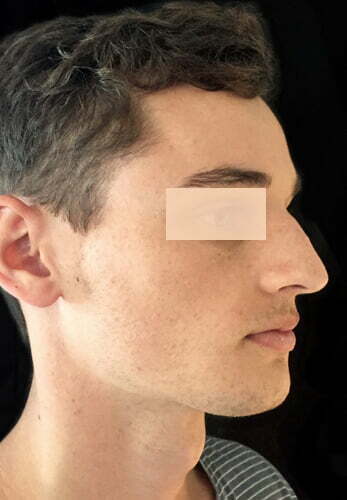 This provides greater surgical access for more extensive rhinoplasties. Although a scar usually does remain as a result of an open rhinoplasty operation, this scar is normally very small and barely noticeable over time. 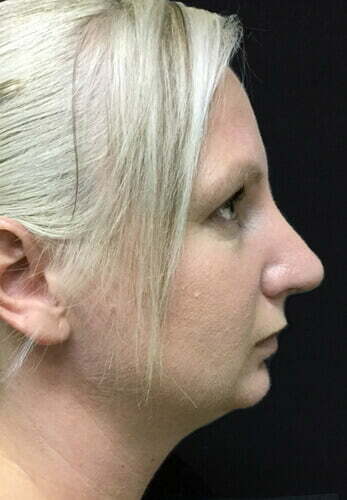 Rhinoplasty is performed under general anesthetic and the entire process normally takes approximately 2 to 4 hours. The recovery time also depends on the patient and the type of rhinoplasty, but usually patients return home on the day of the surgery. A moulded brace is placed on the patient’s nose and is generally removed approximately 7 days after the surgery. Patients are given pain relief to take at home and most find any discomfort very tolerable. Persistent and quite dramatic swelling in and around the nose is very common, as is bruising which can extend up to the eye area. The swelling disrupts normal nasal breathing, however, this subsides and most patients find they can breath normally through their nose in the weeks after the operation. Although a rhinoplasty is generally a very safe and common procedure, it is very important to choose a capable and experienced plastic surgeon for your rhinoplasty. Dr David Sharp has performed many successful rhinoplasty procedures and has dealt with a range of different nasal correction issues over the years. Before each rhinoplasty, Dr Sharp conducts an in depth consultation regarding your particular features as well as the likely outcome, recovery time and cost of your particular rhinoplasty. By conducting an assessment of your nasal structure, Dr Sharp will point out the necessary corrections as well as the techniques that may be required. Finally, you will also be informed of any potential risks that might occur during an operation. Although complications are rare, there are certain postoperative measures that you are advised to implement in order to reduce the chances of them occuring. 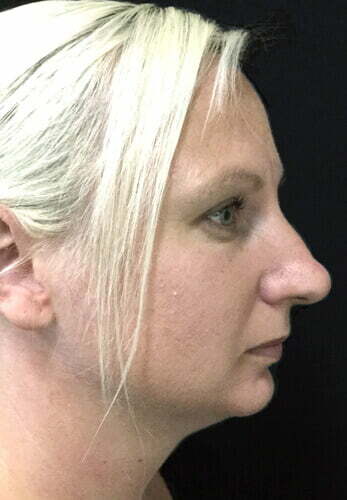 If you are interested in finding out more about rhinoplasty surgery, contact us today for more information. The swelling from rhinoplasty can take many months to subside, so this procedure requires great patience! The photos on the left show a patient before, and 12 weeks after, surgery - and still shows signs of some residual swelling. In most patients, the final result will slowly emerge over the 12 months following surgery.